Track cycling is a racing sport, usually held on specially built tracks called velodromes, in which participants ride on track bicycles. Track cycling is popular in New Zealand, and competitions and events are frequently held here. Even toddlers can try this healthy exercise! Is track cycling right for your kids? Cycling is the perfect activity to enjoy with your family. Not only can it be performed as a competitive sport, it is also a great form of exercise that will help you stay fit and active. Bicycling can even help the environment by reducing the number of vehicles on the road! Track cycling for kids is similar to other cycling activities for kids, except it is done on the steep tracks of a velodrome. If your kids are beginners in cycling, it is a good idea to let them try road cycling or recreational cycling first so that they can practice on smooth, flat ground. Most beginners will need a bike with training wheels until they learn how to balance on their own. If you want to enjoy cycling with your kids, you might consider a club cycling. Your kids will be introduced to all aspects of track cycling, including track cycling rules and track cycling gear (usually gloves, a helmet, elbow pads, knee pads, and shin guards). Get your kids to try track cycling! To get started, head to the nearest bike shop and buy your toddler their first bicycle! Bike shops also have complete sets of cycling gear for all ages. Once they have mastered the basics of cycling, you can enrol them in a track cycling club and let them join a team. Any kind of bicycle can be used, but an ideal bike for track cycling is an electric bicycle for its pedal-assist function. 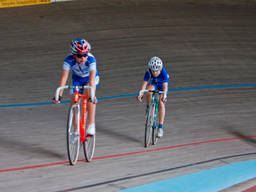 As your kids grow older and become better at track cycling, they might want to pursue it as a hobby or even a career. Track cycling has been featured in every modern Olympic Games, as well as national events in New Zealand, including the Revolution track series. At local and regional levels of competition, riders will compete in all events, and later specialise in events as they progress to national and international levels. Encourage your children to try as many track cycling events as possible: This will help in identifying their strengths and weaknesses so they can build a solid skill set. Sprints: 200-metre time trial with three laps per race. Keirins: first person to cross the finish line after two kilometres wins. Team Sprint: three-lap timed race between teams. Team Pursuit: four riders race for four kilometres in a timed race. Individual Pursuit: similar to team pursuit, only with individual riders. 200-Metre Sprint: used for time trials to seed racers for the sprint race. One Kilometre Time Trial: a time trial race which begins from a dead stop. The rider who completes the distance with the fastest time wins. Points Race: 15-kilometre race (or 60 laps) on a 250-metre track. Every 10 laps there is a sprint for points. Scratch Race: can be any length, and a lot of riders can join at the same time. First to cross the finish line wins. If your kids are into more extreme sports, you might like to encourage them to try dirt bikes! For a comprehensive list of kids activitie in New Zealand, as well as more tips on track cycling, visit our ActiveActivities directory. Track cycling for kids is a great activity that can help channel your children’s energy in a productive and healthy way. Get them to try it at a young age!